I am excited for the future of HBT Sports. Sure, it’s been an ugly couple weeks: we’ve missed some deadlines and made some typos; and I wouldn’t be surprised if our Editor-in-Chief, Colin Henderson, was having recurring nightmares about my increasingly verbose fantasy articles. Sorry Colin. Despite all of this, I am excited. At least from where I’m sitting (on a bus, if you must know), there’s so much potential. Our fantasy staff is growing; HBT is recruiting more writers for all subjects, including basketball and hockey; and, those of us who have been here for a few weeks are starting to get the hang of things. It is, all in all, a good time. I say all this because it is my hope that everyone has that same kind of excitement about their fantasy team. See what I did there? You just got metaphor’d, biatch. Despite a couple of fantasy weeks that had Charlize-Theron-in-Monster levels of ugliness, there is no reason to expect your season to have anything less than Charlize-Theron-in-everything-else levels of beauty. The trades, waiver wire pickups, and starts/sits made over the rest of the season are what’s really crucial, not a few flukes from the beginning of the season. There are bound to be bumps at the start, but that’s just how things go. By now, everyone should be starting to get a feel for their team and should start to know what to do going forward. Of course, for those of you who don’t, I’m here to drop truth bombs. Said truth bombs will be dropped in a slightly different format than a few weeks ago. My preview will still be a sort of love/hate, but I have decided to expand it to a general preview that takes general positive and negative trends, and applies them to specific players. In the interest of shameless promotion/making sure readers never forget the name of this website, I’ve decided to call the sections How ‘Bout These Guys and Not ‘Bout These Guys. For an article specifically dedicated to love/hate, check out the love/hate column on our fantasy page. And, as always, be on the lookout for more articles on our website. I’m psyched about the direction it’s going. Anywho, let’s get to it. 1. In my Week 2 recap, I referenced the Civil War in passing (#johnbrown #neverforget). Continuing with that metaphor, this past Sunday was like the Battle of Gettysburg: total carnage. Bodies dropped left and right, from Drew Brees, to Eddie Lacy, to the entire Cowboys offense. That leaves some holes that need to be filled, and I’m here to fill them (hehe). 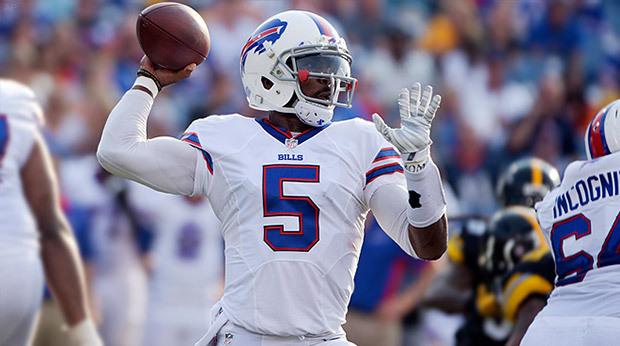 In terms of QB, Brees and Romo owners may want to target Tyrod Taylor, who is averaging 20 fantasy PPG and is up against a Miami defense that allowed Blake Bortles 20 points last week; or, they may want to target Ryan Fitzpatrick who, Decker injury notwithstanding, is poised to have a solid week against an Eagles secondary that allowed over 18 PPG to opposing passers last year and have been only marginally better this year. For RBs, Lacy owners should target James Starks, who played well in Lacy’a absence, racking up 95 yards on 20 carries. And with the Cowboys passing game now in the hands of Brandon Weeden (I just threw up in my mouth a little), both Joseph Randle and Lance Dunbar will get more opportunities: Randle will get the early down work, and Dunbar will get all of Weeden’s inevitable dump-offs. Lastly, for those who own Jason Witten– who is likely to start but won’t do much due to having two sprained ankles, a sprained knee, and (still choking back vomit) Brandon Weeden at QB– there are a surprising amount of good TE options who are unowned. Heath Miller is available in 30 percent of all leagues, and I think he’ll have a solid game against a Denver defense that allowed the fifth most fantasy points to TEs last year– and whose dominant pass rush has forced quick outs to TEs in the first two games this year. Jared Cook, who is unowned in almost 80 percent of ESPN Standard leagues, has lead the Rams in targets and receptions over the past two games, and he goes up against a Steelers defense that has been susceptible to tight ends this year. For more waiver wire targets or injury plugs, check out Derek Nadeau’s waiver wire targets for Week 3. Hooray for shameless cross-promotion! 2. Ok, that first section was much longer than I’d hoped. Sorry; I get excited sometimes. To keep things simple, this section can be summed up in one sentence: Isaiah Crowell will be a top-15 play this week. I’ll admit, I have a vested interest in his doing well, because the jabronis in my league won’t stop mocking me for picking him in the seventh round. I really do like him this week, though. 57.1 percent of the Browns’ red zone plays so far this season have involved Crowell; and, this week, he goes up against an Oakland defense that has allowed more fantasy points against running backs than any other since the start of 2014. Other cushy matchups this week include the aforementioned Randle and Dunbar against the Falcons; CJ Anderson against the Lions (don’t you dare bench a first round pick in Week 3, you idiots); and Jonathan Stewart against the Saints. Remember to always play the matchup, people. There’s this thing called the Internet, and, in addition to funny videos of cats, it has every fantasy stat imaginable, including the all-important “Fantasy Points Allowed” and red zone usage stats that I’ve referenced in this section. 3. America’s favorite DraftKings spokesmen, Matthew Berry, devoted his entire weekly column to this fact, but it bears repeating here: be patient with your early-round picks. All is not doom and gloom for Jeremy Hill, C.J. Anderson, and DeMarco Murray. Marvin Lewis and Hue Jackson have both stated that Hill will have a starting role this week, and as I mentioned before, Anderson has a favorable matchup. Murray should probably be benched this week against a Jets line that’s seven human steamrollers, but he has the potential to turn things around. The same piece of advice applies to Andrew Luck and Peyton Manning. Luck is a better contender for a turnaround than Manning (I had previously said to sell Manning because he has looked old lately), but both are in elite, pass-friendly offenses, and both are future Hall of Famers. So, when it comes to selling low on someone who was drafted high, I’d like to quote Frankie Goes to Hollywood: “Relax. Don’t do it. When you want to get to it.” Yeah. I don’t know. 1. Let’s call it The Maclin Problem (TM). This is the phenomenon in which a talented receiver posts low number due to the general bad-ness of his offense. At the moment, this problem seems to apply mostly to Jeremy Maclin, Brandin Cooks, and Andre Johnson. Of the three, I think that only Maclin has any value this week. This judgment comes from idea of opportunities for a big play, which stems from two things: quarterback consistency and number of targets. Maclin is the only receiver at the moment who has both; he leads his team in targets and, while Alex Smith has been middling when throwing to receivers this season, that can be chocked up to the fact that the Chiefs played two excellent pass defenses in Denver and Houston. Maclin has potential. I’m putting in the NBT section because he has yet to cash in on that potential, but I am starting him in one of my leagues because I don’t have better options. That’s the kind of player he is right now: like the person you’ll take home at last call, he isn’t anyone’s first, second, or third choice, but he’s got the potential to show you a good time. Yikes, this column is risqué this week. Johnson and Cooks have no potential this week because each misses out on one of the two parameters for big play potential. Johnson is behind T.Y Hilton and Donte Moncrief for targets, and he’s soon to be passed by Phillip Dorsett. Heck, I wouldn’t be surprised if the Colts brought Reggie Wayne out of retirement and put him ahead of Johnson on the depth chart. That’s how bad things have been for him (he’s only caught 41 percent of the few looks he has got). Cooks, for his part, has been a bit better, leading his team in targets and catching 60 percent of them. The problem with him for this week is his quarterback. I like Luke McCown: I like his name (duh); I like his Verizon commercials; I like that he and his brother are the Peyton and Eli of backup QBs. I like him, but he’s not very good. It’s that simple. Johnson isn’t getting looks, and Cooks is getting Luke. The Maclin Problem is real, folks. 2. Because this column is long and I want to wrap it up (the bus I’ve been on has almost reached its destination), I’m going to end it by quickly rattling off enticing running backs with unfavorable matchups who should be avoided this week. –Devonta Freeman (RB, Falcons): His matchup against an impressive Cowbos run defense is the least of his problems. The Falcons line is unfathomably inept, and Freeman has yet to show that he’s capable of anything special. –The Johnsons (RB, Cardinals): David Johnson and Chris Johnson have both been popular waiver pickups with Andre Ellington out. Starting either this week would be a bad decision. Though I’m sure he is a nice human being, Chris Johnson has been a worthless garbage football player since leaving the Titans. Even after David Johnson’s breakout game last week, DJ is still behind CJ on the depth chart, so he will lose touches to the elder Johnson. Neither is a good start in a pass-first Cardinals offense going against a Niners defense that held Adrian Peterson to 30 yards in Week 1. –Ameer Abdullah (RB, Lions): Oh how the mighty have fallen. Everyone and their grandma’s offseason darling has a whopping zero fantasy points this week. This week will be no different.The Broncos allowed the ninth fewest fantasy points last year. The Detroit Lions, on the other hand, have developed a platoon system; the world’s most anomalous and random platoon system. I’m pretty convinced that OC Joe Lombardi decides who runs each play by blindfolding himself, throwing darts at pictures of Abdullah, Theo Riddick, and Joique Bell, and seeing what sticks. Sit Abdullah; we all know the Lions will be. So that’s it for now. I included fewer talking points than I would have liked this week, because each individual section was so long. I’m still working on the whole “brevity” thing. For articles about players I failed to mention, check out the rest of the excellent articles in HBT Sports.